You can do it during the day. You can’t do it at high noon, but early morning and twilight hours are fine, twilight is best. You don’t have to worry about keeping a moving star in the field of view. I know, I know. It’s not the star that’s moving, but you know what I mean. Perhaps best of all, the artificial star and your telescope only need to be ap-proximately 20 feet apart, maybe 30 if you are operating at very long focal lens. We all know that proper collimation can make the difference between pretty good and stunning views at the eyepiece of any telescope. This is even more important when you’re imaging the heavens. Like most astronomers I hate to use valuable clear sky time on anything but viewing and/or imaging. Every now and then I give it go, and usually end up stopping when I get a reasonably good set of diffraction rings. I know it could be better and that I really should take the time to get it “right”, but I run out patience and deem the image quality good enough. Not only do I not want to spend night time collimating, but when I’m trying to be steady enough to do a good job of collimation it seems like I have a “Fresh Meat” sign plastered to my back to attract all the mosquitoes, gnats and other flying and biting insects in a 10-mile radius. I also feel like I spend as much time re-centering the target star as I do adjusting the alignment of the optics. To solve these problems, I picked up a Hubble Artificial Star device to use for collimating my telescopes. This little device is pretty slick. 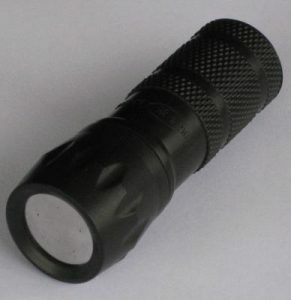 At first glance it looks like nothing more than a little flash light. However, when you look a little closer you realize that it’s got 5 really bright LED’s and 5 pinholes of varying sizes, as shown in the “All Stars Lit” image. You only need to use one of the stars at a time. You choose which opening to use based on the size and focal length of your telescope. The device comes with a small magnetic mask that you place on the front to block all but the one “star” you are using at the moment. You can see the mask in the “One Star Lit” image. Okay, enough about the concept. Does this thing really simplify collimating a telescope? The short answer is absolutely yes! Not only does it work, it’s quite simple to use. I attached my telescope to a heavy-duty camera tripod for simplicity. Then I just placed the Hubble Artificial Star(s) on the stone wall (resting on a towel) that separates my yard from the local golf course. I’ve suspected that my scope was out of collimation but I hadn’t realized how far off it was. When I aimed this little gem at the optics and defocused the light, it was immediately clear that I had work to do. I’ve never collimated a refractor before, but I have collimated my SCT and quite a few reflectors so I understand the objective pretty well. In fact, I can collimate my SCT in under 5 minutes after hauling it across Massachusetts for the Summer Star Party hosted by the Rockland Astronomy Club every year. But a refractor doesn’t have any mirrors. So how do I adjust the lenses? I had previously done some online research (I love the net!) and found some information on where to find the collimation screws for my telescope. I even tried to collimate using a real star, with no success. The movement of the star and the small set of rings frustrated me before I was able to get the thing well collimated. I’m not very patient sometimes and trying to figure out how to do this on a small refractor that should have been perfect on delivery wasn’t a recipe for success. Besides, I have other telescopes that are ready to go and the clear skies have been very infrequent this year. Enter the Hubble Artificial Star and I can now do this while it’s still too light to see or image anything non-terrestrial. I quickly realized why collimating a short focal length refractor is harder than my 8” SCT. The diffraction rings are much smaller and harder to discern in the view presented by the refractor. But eventually (I’m a little slow sometimes) I managed to interpret the rings and the effect of each of the adjustment screws. From there it was a matter of tweaking the adjustments until I was satisfied that the diffraction rings were even and consistent on both sides of focus. When I was done, I could see the smallest details on the towel holding the artificial star. I could also see ants crawling around on the wall and the towel. At first, I thought it was on the telescope objective, but then I remembered I can’t focus close. If I didn’t know better, I’d swear they were taunting me. Because I’d never successfully collimated a refractor (or a short focal length telescope) before, it took me over an hour to get this done. I would never have had the patience for this if I had to use a real star and account for its relative motion. But the Hubble Artificial Star really made life easier for me. Next time, I’m sure it will go much quicker. As I was finishing up, my neighbor was just cranking up an impromptu party with friends and family, including young children. I moved the telescope to a small equatorial mount, pointed it at the moon and invited them all over for a view. At the risk of sounding my own horn, I was a hero! The kids loved it, as expected. My past experiences with star parties prepared me for the reactions of the adults. As usual, they spent more time at the eyepiece than did the youngsters. My own view through the telescope confirmed that I had everything properly aligned. The image was clear, crisp and free of false color. I didn’t take the time to switch from a tired old Plossl eye piece (which is what I always use when sharing with strangers) to one of my high-end eye pieces because the mosquitoes had found me and I needed to take cover. I’d been working outdoors all day and the combination of heat and hard labor made me particularly attractive the little pests. In my opinion, this is probably the best ($25) astronomical investment I have ever made. If your telescope can be collimated, you owe it to yourself to get a Hubble Optics Artificial Star and save every minute of dark sky time for your visual and/or imaging enjoyment. 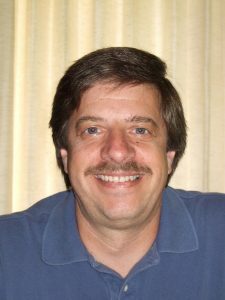 Dave Snay is a retired software engineer living in Central Massachusetts. He graduated from Worcester Polytechnic Institute and has been an amateur astronomer and astrophotographer for a number of years. He also pursues fine art photography and enjoys traditional black and white images.